At HeatSealers.co.uk we aim to find the best quality heat sealers at a price that is right for you. Heat sealing machines are available in a wide variety ranging from simple impulse heat sealers that cost less that a hundred pounds to automated continuous heat sealing machines selling for tens of thousands. Heat sealing is relatively fast and has therefore been a system largely used for packing everything from screws and bolts to sweets and potato chips. We hope to be able to help you find all the information you need about heat sealers here but if you still have any questions please don't hesitate to contact us. Remember to check our for the best prices on polythene impulse heat sealers and layflat tubing. So What is a Heat Sealer? A heat sealer is a machine used to seal product packaging using heat. Continuous heat sealers utilize heated moving belts. Impulse heat sealers use a stationary heated element. Good seals are a result of time, temperature and pressure. Many industries use heat sealers to prepare products for sale, ranging in size from small businesses to large corporations which handle high volumes of material. Various styles and sizes are available from several companies which specialise in making heat sealers, along with the plastic bags to use with them. These are automatically operated heat sealers designed for continuous production runs. Products will be bagged, sent down the conveyor belt, will be sealed and then dropped into packaging boxes for shipment or storage. They feature a variable timer and a built-in film cutter. Continuous heat sealers are much larger and more expensive because of their greater sizes and higher volume capacity. With a single element and are generally designed for manual use. Some are partially automated. 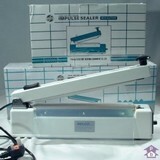 Impulse heat sealers range in price, with simple desktop versions being very affordable. Impulse bag sealers or impulse heat sealers work by releasing a short burst of electricity through a resistance wire that will bring a polythene bag, or other plastic materials, to its melting point and welding both sides together. Impulse heat sealers won't get hot by just plugging them in. It will remain cool until you bring the sealers jaw to contact with the plastic film. Activated by the placing plastic film or layflat tubing between the jaws and pressing the upper jaw down to come in contact with the material, Usually available as tabletop models. Some are also available with a sliding cutter that can be used once the bag has been seald. Just slide the cutter with the opening jaw still closed to have the remaing polythene film cut off. Usually free standing units that are mounted on a pedestal. The upper jaw will be drawn when the operator depresses the pedal leaving both the operator's hands free. Ideal for sealing polypropylene as they provide constant heat, required to seal this types of plastic, creating a wide crimp seal. Normally tabletop heat sealers whose jaws are activated automatically by dial-controlled timers. This type of impulse bag sealer may also be manually operated when using an electrical foot switch. Like the pedal impulse sealers, both the operator's hands are left free. For an optimal use of any impulse heat sealer the heating element timer must be set to produce enough heat to melt the packaging material for only an instant. The correct time is critical to the successful operation of any impulse bag sealer. If the heating timer is short it will result in a weak seal and the bag will tend to burst. If too long the plastic will 'burn' instead of melt and will also result in an inferior seal. Instructions on how to properly set the timer are normally found on your heat sealer's manual. Impulse sealers are fast and efficient tools to securely seal many types of packaging materials but are not recommended for cellophane, laminated polypropylene or other cello -like materials that require the temperature set-point to be maintained for fixed periods of time. Heat sealing with a heat sealer is a good quick solution for a wide range of products and is a way to assure that a company's product will maintain its integrity to the point of use. A heat sealer should be built on a robust platform to stand up to rigorous continuous use. In the case of impulse heat sealing, it should mechanically absorb the thermal environment away from the platen after heating and it should be built with good electronics that manage the temperature at the critical thermal environment. A quality heat sealer should also provide safety features to prevent injuries to the user. The important thing in finding a quality heat sealer is not only to locate a company that provides a heat sealer that just uses time, pressure and heat to seal products but also to find one that is reliable for every seal. Goldstork: good "best of the web" directory where useful links are organized into specific categories to help you find exactly what your looking for. On Goldstork you will also find selected information and links to great websites specialised in plastic film. PackagingKnowledge: with articles and news regarding the flexible polythene packaging industry including this article on poly-tubing and sheeting.